You might have noticed a change, however modest, to the blog site’s cover photo. I went from a generic beach shot to a specific one, taken at the Indiana Dunes State Park. I took the photo in late November, when a pleasant Saturday afternoon allowed me to take Erwin Garcia, our since-departed Guatemalan exchange student, on a hike at the state park. Naturally, I took him on the trail that culminates with a trip around the pictured scene – the Beach House Blowout. 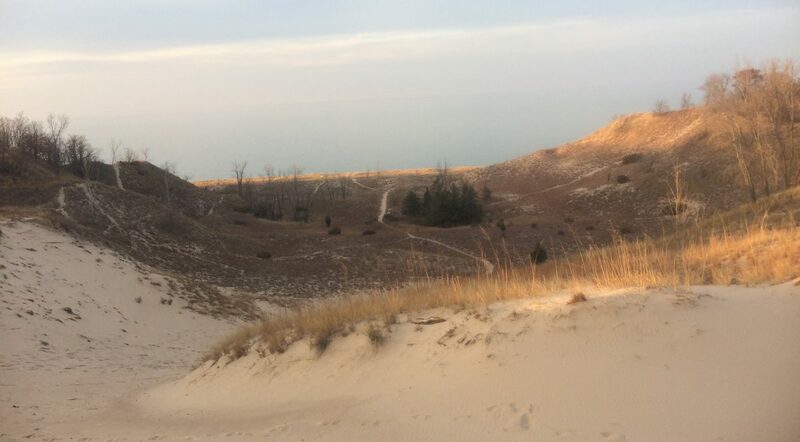 This amazing natural feature of the Dunes offers incredible views in all directions. To the north, the beach and Lake Michigan, planet earth’s best body of water, and the blowout below (featuring pine trees, for crying out loud). To the east, heavy dune grasses that resemble a meadow. Over to the west, you see where the forest meets with the beach. And if you turn and look to the south, you’re standing well above the tree tops as far as you can see. All the while, you’re standing on a ridge no more than 10 feet wide that drops damn near straight down on either side. Granted, I haven’t been that many places. But this is my favorite spot on Earth. I shot a 360-degree video from atop there, complete with Erwin, but the site doesn’t allow video. Maybe I’ll link to it at some point.